'Khartoum', a big motion picture from Hollywood, was made in 1966. It starred Laurence Olivier as the 'Mahdi', and Charlton Heston as 'Chinese Gordon'. Like many movies, it plays with the actual history. However, unlike most it follows the historical narrative fairly closely. The movie deals with how England came to be entangled with Sudan. If you haven't seen it, take a gander. It is a perfect segue for this book. Like the movie, the author begins with the history of Sudan and the rise of Muhammad Ahmed as the 'Mahdi' the expected one of Islam. According to either Sunni or Shia beliefs and writings, the Mahdi will rule all of Islam before Jesus comes back for Judgement Day. The book takes us back to the early days of Muhammad Ahmed's life, and goes into the history of the Sudan, explaining that it was considered a part of Egypt at the time. Egypt was still considered a part of the Ottoman Empire in the late 19th century. Egypt was ruled by a 'Khedive', roughly a governor for the Ottoman Sultan. Egypt however, was only nominally under Turkish rule, and was greatly under English sway. The Khedive's armies were smashed by the Mahdist forces, so he asked England for help. The English prime minister refused to get involved other than to send General Gordon to supervise the removal of Egyptian citizens out of Sudan. Gordan had other ideas. He attempted to fight the Mahdists with the few troops on hand in Khartoum. Gordon and the troops were then besieged in Khartoum. At this time public opinion forced the English government to form a relief force to save him. The relief force was under Lord Wolsley. It was too little and too late. Gordon was killed with the relief force just days away. This was in 1885. This campaign was where Kipling came up with his poem 'Fuzzy Wuzzy'. This was an English term for the Sudanese warriors. Strangely, the poem praises the Sudanese warriors' valor and commends them on the fact that they 'broke a British square'. The above history takes up roughly the first third of the book, just so the reader can get a grasp of the history up to the main part of the book. British involvement continued to grow in Egypt, and in 1892 Lord Kitchener became the 'Sirdar' or Commander-in-chief of the Anglo-Egyptian army. The Mahdi had died not too long after the fall of Khartoum to his forces. His Sudanese uprising continued under one of the three men he named as Khalipha (Caliph) Abdullahi Al-Taishi. The British press still campaigned for England to avenge Gordon. 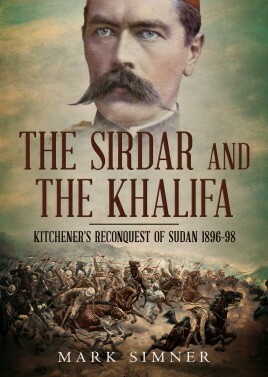 The rest of the book covers the campaign of Kitchener to reconquer Sudan. The Anglo-Egyptian Army was now much better trained and armed. The battles of Omdurman and others are shown to the reader. These include some of the last successful cavalry charges in history, including none other than a young Winston Churchill with the 21st lancers at Omdurman. Omdurman was the last great battle between a European army and one of so called 'savages'. Although the Sudanese fought valiantly, the Anglo-Egyptian Army was even equipped with some early machine guns, so the issue was never really in doubt. The author, Mark Simner, knows his history well, and writes engagingly about it. He even continues with the 'Fashoda Incident', which almost brought Britain and France to war in 1898. The book comes with five pages of maps. It also includes thirty-two pages of black and white photos of the campaign.